The United Nations headquarters in Vienna is celebrating its 40 th anniversary this year, marking four decades of diplomacy in the heart of Europe. 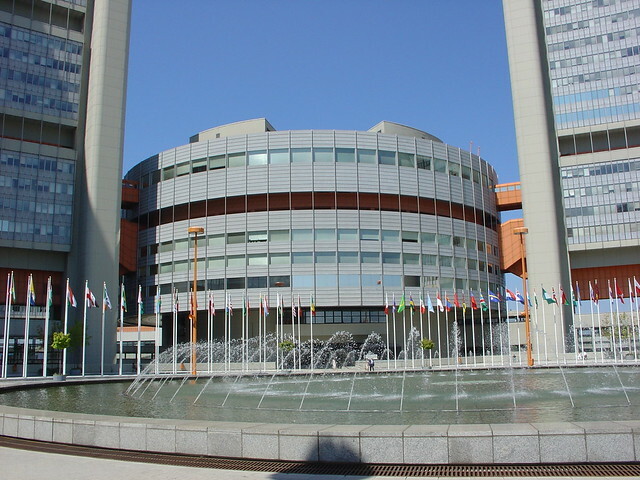 The Vienna International Centre (VIC), also known locally as "UNO City", was officially inaugurated on 23 August 1979. Today, more than 5,000 employees from more than 125 countries are working to improve the lives of people around the world through the United Nations family of organizations and agencies in Vienna. In 1966, the Government of Austria offered to construct an international centre in Vienna for the United Nations system. One year later, the government and the City of Vienna jointly chose a site on the left bank of the River Danube for the new international hub in Vienna. Architects worldwide competed in an international design competition and Austrian architect Johann Staber was the selected winner out of 288 submissions. Construction of the VIC finally started in 1972 and was completed seven years later. The building consists of six office towers, the tallest of which stands at 120 metres, and two conference buildings. Other facilities within the VIC include a medical centre, a library, kitchens, cafeteria, restaurant, post office and a bank. Visitors and staff can make their way through the building using one of 45 passenger lifts and seven escalators. Since 2015, the VIC has been climate neutral. Among its 2,500 parking spaces are electric vehicle charging stations powered by 100 per cent renewable energy. Several events are planned to mark this anniversary, including a high-level event in May, an open day for the public in September and a travelling exhibition in and around Austria that will showcase the work of the United Nations in Vienna.